When working any in-the-round motif pattern, there are a few different ways to start off your motif, and there is no right or wrong way. Some people prefer to crochet a series of chain stitches and join them with a slip stitch to form a ring, and others prefer to use the magic ring method. When working any in-the-round motif pattern, there are a few different ways to start off your motif, and there is no right or wrong way. Some people prefer to crochet a series of chain stitches and join them with a slip stitch to form a ring, and others prefer to use the magic ring method. Both are effective, depending on your own personal preference, but there’s still another way to start off a motif pattern and that’s by using a row of foundation stitches. These foundation stitches are worked from both the top and bottom to create a rectangular shape. This shape is then expanded in the round to create a flat motif. It might sound a little counter-intuitive, but keep reading to see just how it’s done and then apply what you’ve learned to the Mid-Century Motif Cowl on the next page. I have used a thick roving yarn for the visual portion of the tutorial, just because it’s easier to see the stitches made with bulkier yarn. At the end, I also show the beginning of a motif using the actual yarn from the sample cowl, Patons Lace Sequins. 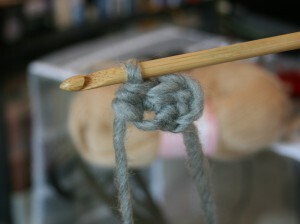 Attaching the yarn to the hook with a slip stitch, chain three stitches. 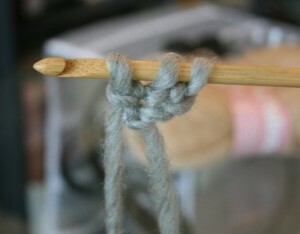 Yarn over the hook, and place the hook into the first chain. 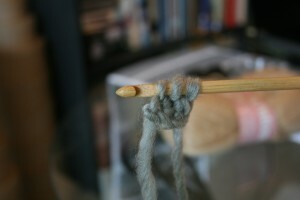 Yarn over the hook and draw a loop through the stitch. 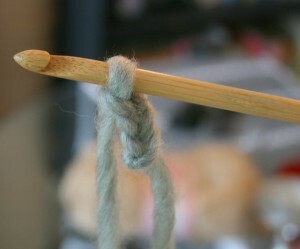 Yarn over the hook and draw through one loop on the hook. 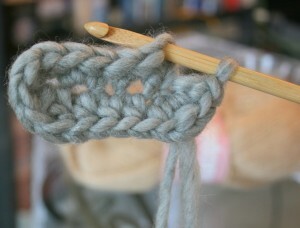 You have just completed the first chain-1, which is the “foundation” part of any foundation stitch. 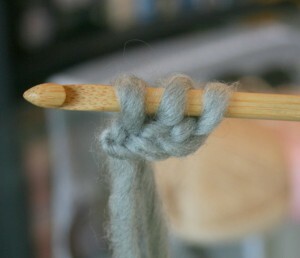 Yarn over the hook and draw through the remaining loops on the hook, which is just like completing a normal half double crochet. 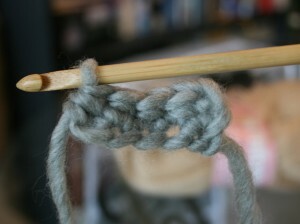 Note that you have a ch-1 on its side at the base of a half double crochet. Yarn over the hook, and for purposes of this tutorial (and the Mid-Century Motif Cowl), place the hook in the front loop of the previously-made foundation ch-1. 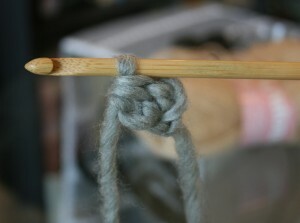 Yarn over the hook and draw up a loop. Repeat steps 4 and 5 above. Repeat steps 2 through 5 as many times as necessary. For our purposes, we made a first foundation half double crochet and three additional foundation half double crochet stitches. 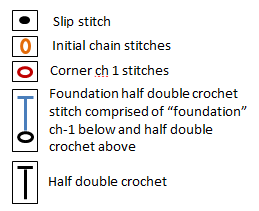 I want to point out that, unlike many tutorials you might see online, I consider the initial three chain stitches made a foundation ch-1 and half double crochet. Chain 1, work 2 half double crochet stitches, chain 1, and one more half double crochet into the final foundation ch-1 space made. This represents the first two corners. Now flip your work so the foundation ch-1 spaces become your working surface. 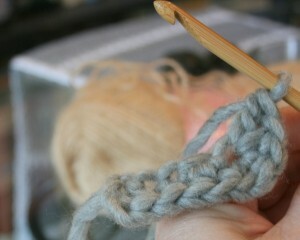 Work one half double crochet stitch Into the next three foundation ch-1 spaces and the initial chain space. You will see that you have a rectangular-shaped crochet fabric with two corners. Into the same st as the last half double crochet made, chain 1, work 2 half double crochet stitches, chain 1, and then slip stitch into the top chain of the initial chain three. You now have completed the first round with four corners around foundation half double crochet stitches worked along both sides of the foundation ch-1 stitches. I have also worked the first round of a small motif in the Patons Lace Sequins. 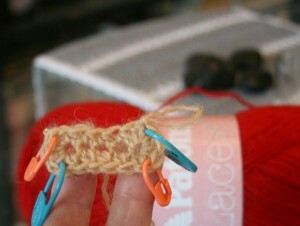 I show it with split ring stitch markers in each of the four corners for ease of reference. I hope you will agree this is a fun way to begin a motif and results in a piece with a well-defined shape that is easy to build upon. 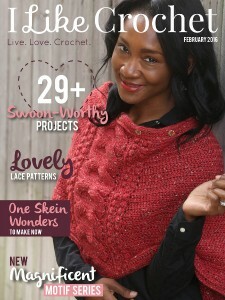 Now you should be ready to give the Mid-Century Motif Cowl in the next section a try. This could be much better with a video. I’m a left-handed knitter – how do I crochet from a pattern meant for righties?